By drbubb, September 10, 2011 in Thoughtful Commentary; "Thinking Caps"
I reckon we need both Wayseers and Scientists on GEI. rather than trying to anihalate each other. I can feel it... do any others agree? Big changes are just ahead. and breakthrough to a greater understanding of the world around us. And, my goodness, do we need to ! === some call it "Junk Science", what do you think ? Based on a hugely popular Internet documentary, this exploration of historic signs and symbolism determines what the future holds for humanity come 2012. In his documentary The 2012 Enigma-viewed more than two million times- David Wilcock exposed many great secrets: DNA, consciousness science, wormholes, stargate travel, sacred geometry, three-dimensional time, the Mayan calendar, and much more. And in this book, his seminal work, he'll expose even more. Calling upon fascinating areas of alternative science, Wilcock's unique philosophy connects the human species and the rest of the cosmos, proposing that it is in our power to usher in the Golden Age prophesied in so many ancient cultures and spiritual traditions. Unlike the doom- and-gloom viewpoints depicted in big-budget disaster films, Wilcock believes that 2012 may be a watermark for when a widespread acceptance of a greater reality will begin to occur-and in his book, he lays out many of the blueprints for such a Golden Age. In this interview, Neil Kramer explains what constitutes a low frequency life, and how living this way limits perception and keeps us functioning far beneath our potential. He talks about how the controllers use symbolism and timing to make sure trauma leaves fertile ground for further manipulation of the psyche and behavior. Kramer says that for the control system to work, it must perpetuate distinctive positive and negative forces, capitalism vs. socialism, the reds vs. the blues, as there must be somewhere to channel aggression and despondency. The biggest disease in the normal construct is this low vibration. Pop stars and kings and queens and junk food and war and Facebook its all limiting, drab, rubbish. If you come to a place of stillness, the unmoving mind, a place of balance, that neutral space you see the world as mysterious and extravagant. The construct tells us we know most of what there is to be known, but as you walk your own sovereign path as master and warrior, you realize that science and politics and education know next to nothing about how this world works and fits together. Human potential is stunningly massive in terms of what is achievable. WHAT SIGNS do you see, if any, as we sit on the eve of what may be a major currency crisis? Will we emerge from this crisis with a new way of thinking? "How could you support him. He/she is simply a puppet of the Powers-That-Be. And I am fed up handing over political power to people like that." Supporting Ron Paul is a way of changing the empty "narrative" in US politics. New thinking is needed in politics too. This is without a doubt the most amazing piece of work I have ever read. I have always been interested in what would be considered "fringe science" and although other authors have made similar assertions with regard to an intelligent "source field" i.e. Dr. Wayne Dyer, Deepak Chopra, etc., none have backed up these viewpoints with such an amazing amount of hard science conducted by so many credentialed scientists and engineers. I have a Masters degree in Electrical Engineering and therefore I have a very critical and logical approach when assessing supporting data to an hypothesis. The references provided by this author are nothing short of excellent but as the old saying goes - "extraordinary claims require extraordinary proof" - and there is no shortage of that to back up this remarkable theorem. I have always believed that the universe itself must be alive and intelligent and Mr. Wilcock's work in supporting this belief will knock your sox off! The work is presented with so many interesting studies that you will find yourself absolutely riveted and unable to put the book down. One has to wonder how mainstream science got so far off track. It is almost as if there was some sort of conspiracy to deliberately dumb down the minds of the people. If the information in this book becomes known and understood by just a small amount of the population, we could be looking at an amazing future for mankind. 68 of the 71 reviews are 5-star. Would agree. I also have a funny feeling that gold has a part to play - in more than just a monetary sense. One of Hoagland's top black-ops guys, who I've met personally, told him the Powers that Were "would rather lose an entire American city to a nuclear attack" than allow the science of what we call the Source Field to ever become publicly known. multiple sources claim two of the underground cities, one near Washington D.C. and another near Denver, Colorado, were destroyed by nuclear weapons last week. There are other research threads about this alleged nuclear strike on the Internet, including an article from "Sorcha Faal", which is almost certainly disinformation from one faction of the US military-industrial complex. Fulford's sources say it's Naval Intelligence. However, in this case -- for once -- it seems they were so shocked by this attack that they actually came relatively close to telling the real truth about what happened. The spin is that it was the result of a war between the CIA and the US Military establishment. "Sorcha Faal" also reveals that these underground cities and train systems have already cost 40 TRILLION dollars to build -- not a very happy thought for people suffering through our current economy! I will definitely try to interview Fulford soon and get more detail on this -- but I'm supposed to be on vacation here! If this is indeed true, there may be a time in the not-too-distant future where all of this becomes public. I did also hear that my three-hour appearance on Coast sent black-ops insiders scrambling to buy the book and read it. I've been told there is great excitement at seeing that this material is now publicly available, as it helps us all in ways not yet visible. The important point here is that even if this was just an earthquake, it was the biggest on the East Coast in a century -- and coincided with the overthrow of the longest officially-recognized dictatorship on Earth -- on the very day the book came out. These were very significant wake-up calls -- and SFI provides a solution to the otherwise faceless fear many are now enduring. You should have been at the Wilcock conference I attended a few weeks ago. People were flying in from all over to be there. I haven't listened to this c2c talk nor read his book yet but the conference covered the subject. The audience just loved him. DW appeals to a different demographic to George Kavassilas - much younger and majority of men, quite young ones too. I never cease to be amazed by the extent of human gullibility. "...these underground cities and train systems have already cost 40 TRILLION dollars to build." If that such an unbelievably huge money was spent, the money would have gone into someone's hands (contractors, machinery, and cement suppliers etc. ), and we would have seen some evidence for that... in a jump in GDP, or in the coontractors' income or P&L statements, or in their spending as they pass the money on to their own subcontractors or business partners. The only alternative might have been if the work and materials were paid for in Gold and other commodities, and that metal handed over "went off world", or directly into storage. Is he suggesting something like that? If so, it is a strange tale, that needs more explanation. The eternal skeptic, and we always need a touch of that. Did you bother to listen to ANY of it ?? "The day before the book came out, on August 22nd, I did a one-hour radio show on WBAI's 'Heart of Mind' program, and I feel it went very well." Why don't you ask Catherine Austin Fitts for her opinion on this $40T? She's been trying to track the money and concluded that it's gone off-planet. I used to be a subscriber and I think I heard this in one of her weekly broadcasts. I don't remember the number bandied but certainly in the trillions. I think she picked up "$2.3 Trillion of spending by the Pentagon is unaccounted for,"
by Donald Rumsfeld, just before 9/11. That's a long way from $40 Trillion. I emailed CAF today to ask if she agrees with the $40T spent on underground bases. Lots to be interested in here. She gets to oil about 3/4 of the way through. "We are all shipping our money into Washington (and Federal control.)" "The tapeworm economy is draining us... we need to delink from the central economy." "Biggest danger: the way they control seeds and food supply." "Controlling oil, and having a strong military... are key control mechanisms." "Transparency is important: If you can do dirty (halfway around the world) and still be acceptable, then you can get away with crime(s)." Many "alternative media observers" think there is a high risk of some sort of Event today. Let's see if anything happens today. Solar activity remains at active levels. NOAA AR 11283 produced an M1.2 flare on September 9 with peak time 12:49 UT and an M1.1 flare on September 10 with peak time 07:18 UT (causing a type III radio sweep). The second M flare was possibly triggered by a filament eruption near NOAA AR 11283 at 01:28 UT on September 10. More M flares or even X flares are possible from this region, with risks for proton events. A magnitude 6.4 earthquake has struck off the northwest coast of Vancouver Island, officials at the Pacific Geo-science Center have confirmed, but there are no reports of damage or tsunami warnings. I do not rule that out* (or in!) - I want to keep an open mind, since I am fairly sure the world is a far stranger place than the average person understands. I have seen and heard convincing evidence for parts of this "greater story", but I cannot discuss it here. But that post was in a way unfortunate, since it may detract attention from the important ideas in David Wilcock's book. I will show some Mainstream Press Reviews here, if and when they turn up. His research led him to the conclusion that ancient Egyptians, Mayans, Hindus and others have left clues that may reveal the secret behind the year 2012, and that the date itself is not indicative of an apocalyptic event, but the start of an epoch that may usher in a higher state of consciousness. Wilcock argues that this transition will be guided by a living energy field—and that this energy field, which he dubs “the source field,” is the fundamental building block of all space, time, energy, matter and biological life, and may be a crystallization of a united, symbiotic consciousness that we all have the ability to tap into. The author provides wide-ranging evidence to support this claim, citing dozens of scientific studies and first-person testimonies, and delves into the mystical connections between DNA, energy and light. He argues that the makeup of the entire universe is geometric in arrangement and motion, and that the year 2012 coincides with many natural astrological changes that could affect human intuitive abilities (namely through the activation of the pineal gland, an idea that is referenced by many ancient cultures). Much of Wilcock's scientific data is cutting-edge: For example, an idea like the holographic principle fits perfectly with his notion that time may actually exist in three dimensions. However, readers should be prepared for some fantastical discussion of alien intelligence, crop circles and time portals. At its core, Wilcock's theories rest on the idea that mankind can usher in this transcended age by expressing love and kindness toward each other and the world—a worthwhile endeavor regardless of one’s beliefs about 2012. Debatable, sure, but the author writes a narrative as fast-paced and scintillating as a sci-fi novel. Now as you may observe from the earthquakes seismograms, it does appear that the latest Virginia quake would more likely be due to a sudden intense shock (nuclear or other weapon could do that), rather than the typical pre-shock (P-wave) followed by the main shock (S-wave), as observed in earlier Virginia quakes. The main point I see here, though, is that all of those who may doubt that anything at all positive is happening in this world should be heartened by what is being seen outwardly the last few weeks, and what people like David and Ben Fulford are reporting from their sources. This is not demonstrating the strengthening of “the cabal”, it is demonstrating its demise. Perhaps the most significant thing that any of us can do now, is to hold all of what is occurring now in a positive Light. Namely, we ARE moving forward (not backward), we ARE headed up (not down). If anyone wishes to continue to maintain a “nose down” trim (airplane term) attitude, it will likely not help anything, and only bring “pain” of some kind to the holder. Is this because of The Grandest Deception? Yet another example of complacent close-minded thinking. If some sort of enlightenment is coming, the close-minded will be the last to experience it. He talks about a primitive tribe on an Indonesian Island. The tribe survived the Asian Tsunami, because a half day before it hit, they climbed to the top of a nearby mountain and waited. Holiday-makers on the same island died because they were complacent, and stayed put. What got them to do that? It wasn't science. It was being open to other influences, like intuition... They were "where they needed to be, when they needed to be there." They were not brain-washed by some conventionally modern idea of science. Mike welcomes Peter Joseph of The Zeitgeist Movement to the show. They discuss humanity's current predicament, what we can do about it, and the importance of working together while implementing the best possible future for as many people as possible. Actually DrBubb you're wrong - I did watch most of it but to be honest I don't know why I bothered - It was total nonsense. The reason I didn't reply was because this is your forum and your topic and if you want to push this rubbish it's your choice. Out of respect I've made the decision to make just one short comment on each such thread to express my view and no more (although I feel compelled to reply to your comment in this case). If you would like me to rip this topic to pieces with real evidence from real scientist I'd be happy to do so but I expect I'd only get another short ban. It would appear to me that many other people on this forum have decided to just ignore these type of topics completely and maybe I should do the same but I'm strangely drawn to such topics, not because I have any interest in them per se, but because I find it incomprehensible that any intelligent, logical, sane person could take them seriously and that’s interesting. Thanks for that response. Even if we do not agree. My opinion is that: Science has plenty to learn from future Research. Even in my own life, I have seen what is considered scientifically accurate evolve and change. Wilcock has done loads of research for his book, and he quotes many scientists - Though I will agree that many of them are not mainstream western scientists. The researchers that he does quote often come from places like Russia. But isn't that a good place to explore "outside the box" thinking? Why not cite one and two examples of Wilcock's ideas, and where you think he has it wrong? His overall thesis is miles away from Mainstream science, but that alone doesn't make it wrong. 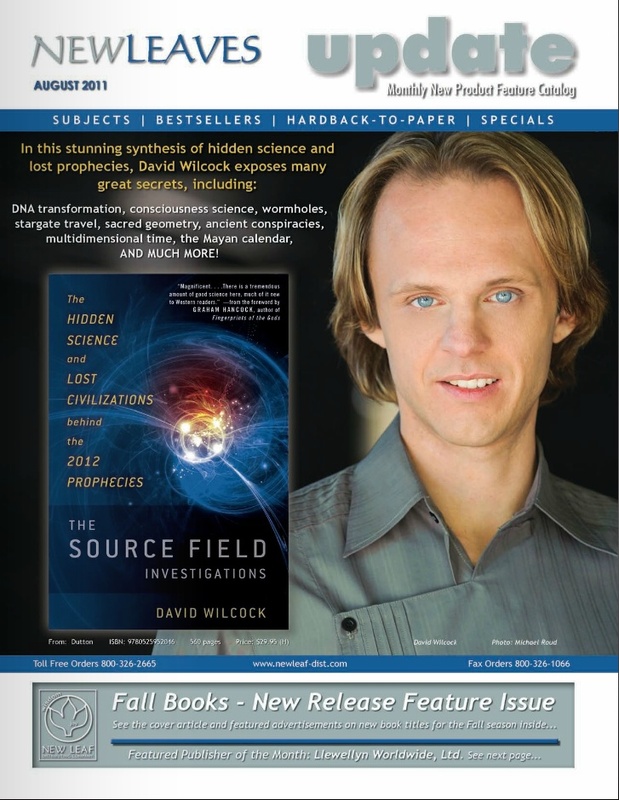 Wilcock's Achievement is that he has managed to back-up the realisations from his Law-Of-One spiritual work with scientific references. His overall conclusion that the Universe-is-A-Hologram is supported by respected scientists like David Bohm*. Personally, I find it rings true to me, that each of us has a piece of "God's consciousness", and if we are spiritually developed enough, we can gain access to greater wisdom. That fits in well with the notions of people like CG Jung, who spoke of of a collective unconscious**- ie each of us has access to a bigger mind through our intuition. Most mainstream scientists become obsessed with tiny prices of the bigger picture, and due to their conservatism find it tough to see the bigger picture. I am naturally cynical of these types of things. My mother had a penchant for them, however I found them exploitative. Having said that, one can be cynical and open, so I would be interested to see what info this thread produces. I was dismayed to see on his website that there are certain free videos, and then some premium videos for further added depth. Personally, I would rather read some Buddhist texts. .... If you would like me to rip this topic to pieces with real evidence from real scientist I'd be happy to do so but I expect I'd only get another short ban. It would appear to me that many other people on this forum have decided to just ignore these type of topics completely and maybe I should do the same but I'm strangely drawn to such topics, not because I have any interest in them per se, but because I find it incomprehensible that any intelligent, logical, sane person could take them seriously and that’s interesting. You would be wasting your time WiseBear, they cannot understand the difference between a scientific theory and a philosophical theory, empirical data or logic means nothing to them and they just create another philosophical idea to ameliorate the empirical or logical, that philosophical idea then becomes a truth to them. You are arguing against belief. This dogmatic following of belief is the reason that I rarely post here. I lurk occasionally for the few financial posts that remain, picking up the odd tip and occasionally dipping in the posts on current affairs. Originally like others I came from HPC following Bubb, CG, GF, etc to get a better understanding of finance, its implications and how I should protect myself financially. I learnt how to begin to do that on this site and I thank all for that education. It’s Bubb’s site, it’s his playground and if he wants to turn it into a conspiracy site because that is his religion then so be it and those that are here for finance will continue to drift away. He devotes all his time to his researches and presentations, and needs to make a living somehow. To be sure, he gives many free interviews, videos, and other information. if you want to know more without paying anything. He is fast becoming the "rock-star" of alternative vision presenters. At one point, he was seen to be a reincarnation of Edgar Cayce - there's a define physical resemblence (see below.) But he plays that down now. I have linked to some information about David Bohm and Carl Jung, but the skeptics have nothing to say but "It is nonsense." I suggest you do you own research based on the many references that Wilcock gives in his video and in his books. "Bohm believes the reason subatomic particles are able to remain in contact with one another regardless of the distance separating them is not because they are sending some sort of mysterious signal back and forth, but because their separateness is an illusion. He argues that at some deeper level of reality such particles are not individual entities, but are actually extensions of the same fundamental something." After having tried to explain the difference several times before, I couldn’t agree more. There is a world of difference between a testable scientific theory, and an idea that someone has to explain something. For example, some time back there was a thread relating to the holographic universe theory put forward to explain one aspect of quantum entanglement (spooky action). The post sited the Nature paper from Grobalcher et al (which didn’t actually mention anything about the holographic universe theory), but rather used a repeatable testable experiment to suggest that realism and locality are not linked. With this intriguing result, one possible explanation put forward was that we might be in a holographic universe, as has been suggested by Bohm and others. The response from one poster (whom I will not name) was along the lines of “Well, yes, David Icke has been saying this for years”. Needless to say, as a scientist, I was a little miffed by this comment, and said as much at the time. However, in hindsight I realised that perhaps instead I should have explained that the work of Grobalcher et al was built upon decades (if not centuries) of previous, testable, repeatable work, from which they formulated a theory (after Bell et al) and then devised an experiment to test this theory, (itself an adaptation of similar previous experiments ). I read the full paper, followed their reasoning and then saw examples of their experimental arrangements, fully explained so that I (or anyone else) could repeat it. The results of these tests did imply that, in certain conditions at certain size scales, there is indeed a violation of the Legget inequality. As such, this could be taken as potential evidence to support an element of the holographic universe theory. But this is a long long way from saying “The Universe is a Hologram”. Need I say more. (Except perhaps that perhaps this thread should be on the fringe section, where it belongs). Go To Topic Listing Thoughtful Commentary; "Thinking Caps"